5. Big Enough to fit IPHONE7 plus, galaxy note 5. 7. This diamante clutch comes wrapped in plastic bag/bubble bag/Dexmay storage bag/black gift box. Also come with extra stones in a separate little bag. 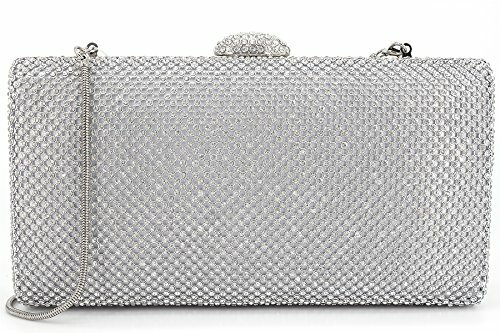 ☻ Material--This women evening bag is made of clear rhinestone A, which is very sparkly like a diamond, no blemishes. Our silver metal frame is no scratch, no bubble, no rust on surface. Smooth Silk Satin Lining. ☻ Dimension-- Approx 8.9(L) x 2.17(W) x 4.8(H) inches. Large rectangle Shape with a nice crystal clasp. This women clutch can fit iphone7 plus, galaxy note 5(other big phone), cards, cash, lipstick, comb, compact, tissue etc. If you have any questions about this product by DEXMAY DM, contact us by completing and submitting the form below. If you are looking for a specif part number, please include it with your message.